I came to Krasnooktyabrskaya Street for the first time on Saturday, August 16th. I put together two packets of items that I wanted to give to the displaced people, said good-bye to my family and left. I was gladly welcomed, however there was no time to be really introduced to anybody, as before the opening of the office by 11 am there was already a long line. However I will also describe it in more detail. The office is rather small, that’s why most of the people wait outside. Once people get inside, at first they go to the registration room. There are two tables there, volunteers sit at the computers and register displaced people. They ask people’s names, birthdays, places where they came from and special needs they have (diabetics, any handicaps, pregnancy, etc. ), phone numbers. Volunteers pick up the phone as well. The whole family is registered right away. Volunteers immediately ask whether the family needs anything particular for children like a crib or a stroller. There is a separate waiting list for items like that and once the needed item becomes available, volunteers call families on the waiting list. In parallel to the process of registration, volunteers check the family among the common database to exclude second application for help. The rule of Station Kharkiv is that the aid package is given only one time, however displaced people can come for clothes and shoes as many times as they need to. Only in exclusive circumstances some items were given the second time. At the end of registration process, each person receives a ticket with which he or she can proceed into the room where they can receive humanitarian aid. The ticket doesn’t have any special information, just a number and a quantity of adults and children. It makes it easier to collect humanitarian aid in the warehouse, because aid packages for men, women and children are different. Near the registration room, there is a recruiter who helps people with looking for job opportunities. Recruiters had their own database, but they were mainly helping people to figure out job opportunities on the Internet or on the bulletin boards. Believe me, it is rather difficult to figure out how to look for a job in a different city without permanent living arrangements. In the hallway in the office there is water, plastic cups and a bathroom. The walls are covered with useful information that includes addresses of the Red Cross, Pension Fund and so on. All the clothes was sorted into male, female and children’s clothes. In August all clothes was used. It was brought by Kharkiv residents. However in September several stores and companies started sending new clothes for displaced people. I saw several new tracksuits, waistcoats and jackets. In the same room volunteers help people to find the necessary clothes, because there is a lot of clothes, but very little space, so there is no possibility to sort clothes by sizes and hang, so it’s convenient to find what is needed. Without volunteers it is rather challenging to find what is needed. After the room with clothes, there is a little staircase down – into the basement – this is warehouse where all the humanitarian aid is collected. That’s where I spent most of my time when I volunteered in the office on Krasnooktyabrskaya Street. Above warehouse on the second floor, there is a room equipped as a nursery. It has a lot of toys and books. In this room volunteers-psychologists and teachers work on a constant basis. In the same room parents can leave their children while they are finding the necessary clothes and receiving humanitarian aid. By the way, the pool on the picture was also brought by somebody. So, I arrived. I went straight to the warehouse since it seemed logical. I gave the things I brought and asked how I can be useful. At that moment, there were two other girls there (not by age but young at heart:). Irina was the one and I completely forgot the name of the second. They tasked me to do organizing, sorting and giving away bedding sets. Process is the following: a person with a ticket comes to the warehouse, we assemble a standard aid package for him or her, ask whether he or she needs kitchen supplies or a bedding set. And this is where I fit in and put together sheets, towels and bring them. Until the end of August all bedding was used and mixed. After a while we had packages of the same sheets and pillow cases. I’m not sure where it all came from. Most of the people who donated things did not promote themselves. Everyone tried to give bags quickly, asked what’s in the highest demand, thanked volunteers and left. We ran out of sheets pretty quickly, so I switched to the most needed children’s things: baby food and diapers as I was the only volunteer in the room who had a small child. Standard package of humanitarian aid: 1. Food: pasta, grains, sugar, tea, sunflower oil, cans, sweets for children (cookies and condensed milk), baby food. 2. Household chemicals and items: soap, shampoo, detergent, hygiene items, a disposable shaving machine, toothpaste, toothbrush, toilet paper, diapers. Of course, the sets were gathered depending on the number of people, gender, necessities, and availability. Because of limited financial resources, we purchased mostly food, while shampoos, toothpastes, etc. were still in deficit. It often happened that we had to close the warehouse because there was nothing left. We also did not have a car, so volunteers often asked someone with a car to help with purchases and delivery. On my first day, I had tears in my eyes almost all the time. It was simply impossible to hear the words of thankfulness every 10 minutes: “Thank you for what you are doing. Thank you that you are here for us”… But I knew clearly that I was doing so little. One day a 35-year-old woman came in. She looked absent-minded and kept forgetting where she should go and what to do. Our volunteer Iryna noticed that the soles of her shoes were about to tear off. We showed her into the warehouse, gave her a seat and offered her some water. The woman told us she arrived with her daughter, without any clothes and money, completely confused. We gave her a pair of shoes and a dress. In 20 minutes she was smiling and promised to get back next day with her daughter. But she never came again. About one hundred families came in that day, if my memory doesn’t fail me. It was hard to stay inside that old building: hot and stuffy in there, no air conditioning and windows could be barely open. I was standing all day on my feet, without any time for rest or tea. Sure, I could take a break. But how could I do that after looking into refugees’ eyes, so discouraged and waiting? It was just so psychologically challenging. Having figured out that the refugees needed not only clothes but pillows, kitchenware and comforters as well, that evening I looked through my apartment carefully. Next day, on Sunday, I came back with two pillows, linen, cups, and frying pans – all those things that are hard to live without even for a few days. There were not that many people on Sunday, so I and Irina had a chance to chat a little bit. It turned out that she was a teacher, but I can’t recall what subject she taught. Overall, there were many volunteers who had some kind of affiliation with the educational system. Yulia Sokolova, a volunteer, who worked at the registration desk that day, for example, was a teacher of mathematics in high school. It seemed like a big problem for the volunteers at the Station Kharkiv back then, because the school break was coming to an end and all the teachers had to return to their main occupation. But things worked out in a completely different way; by the end of August almost everybody, who worked there, was a displaced person. They came asking for help and decided to stay and work at the Station. During my first and second volunteer shifts I saw neither Zenya Dyss, nor Inna Ichkasova, nor Irina Gaeva. No one from the “Pillars” was there; they were on a trip throughout Ukraine. Elena. A Government employee from Donetsk. She lived near the Donetsk airport. When pro-Russian separatists started bombing the airport she came to Kharkiv with her daughter to stay with her friend. She started working at Krasnooktyabrskaya Street every day in order not to “hang herself”. Her story is more complicated than others because she was not able to get employed legally. In Donetsk she was still considered employed, since she did not have the time to resign from her job before she fled. That is why she could not register at the local unemployment agency either. She had no income at all. I used to see her at the station every time I was there. According to the recent video from Hromadske TV she is still there. Igor. An elderly, very thin man with grey hair. He used to change into work clothes every time he came over. He was a doctor, a surgeon in his past life. He used to come to the Station to “be useful”. Later on, as far as I know, he started working at a maximum security correctional institution. Alexei. An always smiling man, willing to help everyone and ASAP. He helped people pick up clothes, talked to them, made some tea and sandwiches for us and joked a lot. I believe he was a Chief Editor of some publication in his past life. Then we decided to have Sunday off. That day was used for repairs and volunteer meetings, etc. That is why I was able to volunteer only one day per week. We saw all kinds of people: humble and demanding, well-to-do and completely broke, honest and corrupted. Some tried to take advantage of us, trick us into giving them humanitarian package twice – they tried to forge the ticket with the number for the humanitarian aid. But there were only very few people like that. Many people were asking for pots. It’s difficult to do without them and new ones are very expensive. People are happy to get anything, old tea pots, bowls, anything they can use for cooking. Before September 1st, there was a big shortage of school supplies. This is the day when school starts. Children of displaced families had to go to school too. We organized a couple of school supply drives; the Kharkiv’s publisher “Ranok” (“Morning”) donated a large quantity of notebooks for young kids, somebody even brought a few boxes with Soviet notebooks. UNICEF helped tremendously! Before the beginning of a new school year, they donated backpacks. 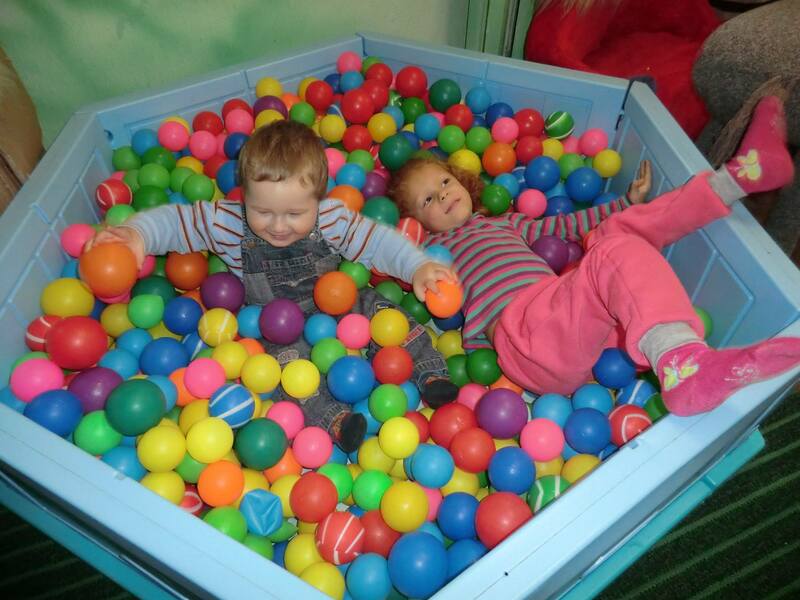 Then, in the middle of September, the Krasnooktyabrskaya location was overstocked with pampers! That was amazing! The word spread around very quickly, and people started to come several times in a row and ask for them. The demand for pampers is understandable: they are very expensive, but very necessary for people who live with friends, wait in long lines, or stay in hostels. One time I even saw the representatives from the United Nations! They were dressed in black blazers and ties; it looked a little odd and out of place. I also visited the railroad station and the former summer camp “Romashka” (“Camomile”). I took an American there, since I am the only volunteer who can speak a little bit of English. I would like to tell you more about “Romashka” (“Camomile”), as they truly deserve it. In 2012 or 2013 an entrepreneurial couple (I believe that they had three children) decided to buy an abandoned summer camp “Romashka”, which is located in the forest preserve, not far from Kharkiv. They planned to convert it into a resort or some sort of entertainment center. But in the summer of 2014, when they heard that Kharkiv was getting people who lost their homes and had nowhere to live, they decided to accommodate them in this camp. After the collapse of the Soviet Union the camp was in a very bad condition. You can only imagine: old buildings, old windows and doors, the heating system was not working. When I visited the camp in August, 300 people with children (only those with children were qualified) had been already living there. Toilet and shower facilities were outside (but the construction of the new ones was almost over). The construction of the new kitchen was about to be completed as well. A very kind-hearted woman-volunteer Valya together with her son cooked dinner for everybody at “Romashka”: it was extremely hot from the huge pots of cooking food in that small kitchen – I barely lasted 10 minutes there. As early as in August the owner of “Romashka” started to prepare for winter: he tried to estimate the cost of all the necessary repairs at the camp: new heating system, new windows, etc. He actively looked for sponsors, even created a charity fund “The Country Above All”. But his efforts were not successful. A big investment was needed for all the repairs. They had visitors from the United Nations, reporters, refugees held demonstrations in front of Kharkiv Region Administration, however to no avail. Displaced people were still actively using heaters while temperature in Kharkiv was falling below zero, and as a result electricity expenses were reaching astronomical numbers (above $10,000) and the electricity to the camp could have been cut off. This was an older Facebook post. The miracle did happen and now displaced people at “Romashka” have a heating system and are warm! You can read about all stages of this story on their facebook page. They don’t have a lot of posts, just the ones that are really worthy mentioning. There are many sources of funding of Station Kharkiv. It is truly remarkable how many people responded in these challenging times. Geography of sources of funding is remarkable. This includes private help – every day people came and brought money, products and clothes – and aid from Ukrainian and international organizations – Nova Ukraine, Maidan Minessota, PCPM (Poland), UNICEF, other organizations and churches. Lunch at the booth at the railroad station in the most challenging months when there was a huge inflow of displaced people was cooked by church communities. Symphony orchestra Slobozhanshina had a performance right at the railroad station. Before that the similar action happened in the Organ Hall. Various fundraisers were held during performance of local bands in rock clubs. In various friendly supermarkets (not all supermarkets viewed this as a positive idea) Station Kharkiv organized collection of food for displaced people. The idea of a flashmob was rather simple. In the social media there was an announcement of the collection of various items at a particular time at the transit place, so it would be convenient for everybody to get there. You can see on the photo a lot of items near Metro Station Sovetskaya. There were also various flee markets, fairs and so on. There were also fundraisers in schools focused on collecting items for the school year. Children brought school supplies for other children. No Replies to "A story of My Acquaintance with Station Kharkiv"
Nova Ukraine is a non-profit organization dedicated to raising awareness about Ukraine in the US and throughout the world and providing humanitarian aid to Ukraine. 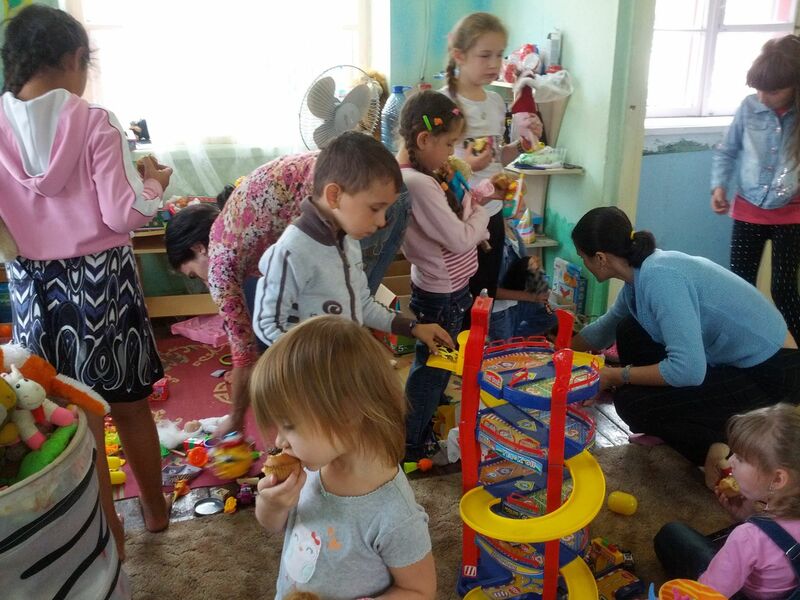 We work closely with non-profits and volunteers focused on helping Ukraine. We organize fundraisers, meetings with Ukrainian famous people, round tables discussions dedicated to Ukraine and Ukrainian culture and participate in various cultural events. Since December 2013 we have collected over $100,000 in donations. 1. Provide humanitarian aid to vulnerable groups and individuals in Ukraine. 2. Raise awareness about Ukraine in the United States and throughout the world. 3. Support Ukraine in its effort to build a strong civil society, to reform its educational system, and to eliminate corruption.